Three main lakes in Africa are home to the most colorful cichlids in the hobby. These lakes are; Lake Malawi, Lake Tanganyika and Lake Victoria. There are hundreds of different species of cichlids in these three bodies of water and new species are being discovered each day. 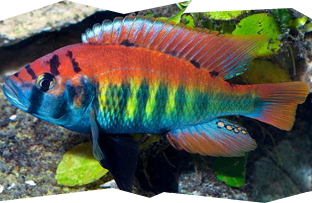 The stunning colors of species like the Tropheus Moorii Ilangi, have made them very popular with home aquarium owners. African cichlids have gained a bad reputation for being aggressive. While it is true that they are aggressive, each species displays varied levels of aggression and their aggression levels can be minimized with the right aquarium set up. The more aggressive Mbuna from Lake Malawi require plenty of space and lots of rocks where they can claim their territories. Other species like Lake Malawi Peacock cichlids are not as aggressive and can co-exist with an open swimming area and some rock formations. For aquarists who like brightly colored fish with their own unique personalities, African cichlids are a top contender. Given the right water conditions (warm, hard water), these beautiful fish are easy to care for and will bring dazzling color to any home aquarium. A large and very popular group of cichlids from Lake Malawi are the rock dwelling Mbuna. 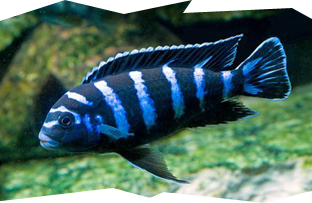 These cichlids vary in aggression from mild to highly aggressive and mix best with other Mbuna. They require plenty of rock formations to claim territories and seek protection. Popular species of Mbuna include the Electric Yellow, the Demasoni and the Auratus. 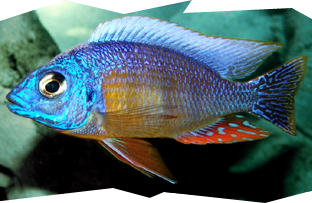 The Haps and Peacock cichlids from Lake Malawi are another group that is popular with aquarium owners. These cichlids display some of the brightest colors of all the fish in Lake Malawi. 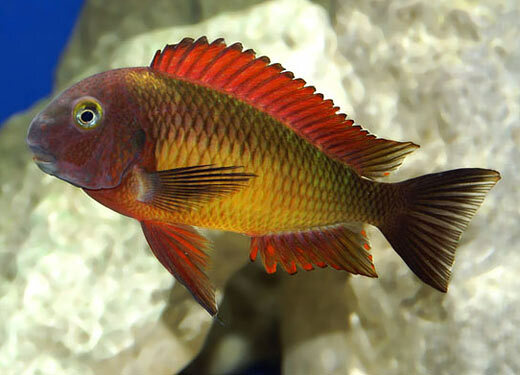 Male peacock cichlids are known to display amazing colors (which inspired their name). Popular species include the Taiwan Reef cichlid, the Sunshine Peacock and the Firefish Peacock cichlid. The waters of Lake Tanganyika are home to the Tropheus cichlids, which are some of the most colorful of all cichlids. Tropheus are aggressive and do best when kept with other Tropheus cichlids. 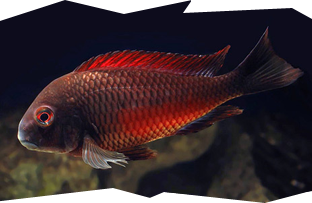 Some popular species are the Tropheus Moliro Red, the Tropheus Bemba, and the Tropheus Duboisi. Other popular Tanganyikan cichlids are the Frontosa and many of the different Julidochormis. The hard water of Lake Victoria is home to several popular and bright colored cichlids. These fish range is size and aggression. Some can mix with Mbuna and Peacock cichlids and others do best with other cichlids from Lake Victoria. Some of the most popular of these fish are the brightly colored Pundamilia Nyererei, the Zebra Obliquidens and the Kyoga Flameback.